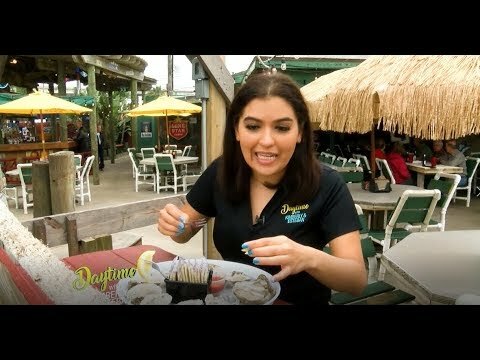 DWKE: Pier 99 by the Corpus Christi Coastal Bend | TV Host Danielle Banda | Corpus Christi Rocks! Danielle travels to the Coastal Bend on another “Road Trippin'” adventure, this time to visit Pier 99 Restaurant… the views from this place are incredible! Check it out! Danielle Banda is an American Media Professional born in Laredo, Texas who has experience in Multimedia Journalism, Videographing, Photographing, Assistant Directing, Acting, Digital Editing, Casting, Producing, and Costuming. She is known for her work in Commercial and Non-Profit Television (2012), Print Media (2015), Radio Broadcasting (2012), Online Blogging (2015), Musical Performing Arts (2012) and Film (2012). Her literary background includes several published works (2005) and she is signed with L.A. Talent agency (2012). Banda graduated with honors from University of Texas Rio Grande Valley, earning a Bachelor of Arts Degree in Communication with an emphasis in Broadcast Journalism (2016) and is in the process of obtaining her Master of Arts Graduate Degree in Contemporary Communication via Notre Dame of Maryland University (2019-2020). She worked as crew on feature films such as “A Night in Old Mexico” (2013) starring award-winning actors Robert Duvall and Jeremy Irvin, as well as “Endgame” (2015) starring award-winning actors Valente Rodriguez, Efren Ramirez and Rico Rodriguez. Banda worked as cast/crew on several nationally and internationally recognized independent films and docu-series such as “Fearless Fight” (2015), Redemption: Between the Lines” (2016), “Piper” (2017) and “Latino Americans” (2014). She also worked crew on the Comedy Central Documentary, “Jeff Ross: Live by the Border Fence (Quarterly Special #3)” starring comedian Jeffrey Ross (2017). Banda served as TV Host (2017) and correspondent at KGBT-TV CBS Channel 4 for the lifestyle show, “Daytime at Nine” which aired weekdays from 9:00-10:00am in San Antonio (KABB-TV FOX 29), Corpus Christi (KQUI-TV FOX 38), the Rio Grande Valley (KGBT-TV CBS 4) and other areas of South Texas. Her celebrity interviews include but are not limited to: Fashion Icon Betsey Johnson, Actor/Professional Body Builder Lou Ferrigno, “Winnie the Pooh” Voice Actor Jim Cummings, “Twilight” Actor Jackson Rathbone, Oscar Award-Winning “Coco” Film Voice Actor Carlos Moreno Jr, NBC’s “American Ninja Warrior” Reality TV Contestant Abel Gonzalez, New York City “Les Miserables” Broadway Performer Mary Kate Moore, NBA Spurs Player Champion Danny Green, Three-Time Olympic Gold Medalist Misty May, etc. Today, she serves as TV Lifestyle Host, Correspondent & Producer (2018) for the entertainment show, “Daytime with Kimberly and Esteban” (DWKE) which airs on KABB-TV FOX 29, KFDM-TV CBS 6, KFOX-TV FOX 14, KSCC-TV FOX 38, KGBT-TV CBS 4, KTXS-TV ABC 12 and other areas of the entire state of Texas as well as regions of Northern Mexico. Banda travels between Texas and California for her career (2012-Present). The Brainly community is constantly buzzing with the excitement of endless collaboration, proving that learning is more fun — and more effective — when we put our heads together. Help the community by sharing what you know. Answering questions also helps you learn! He’s the cop, the Judge, the law baby! Aren’t loyal to donnie? Get out. It’s Beer and Bud Friday.